This article describes an approach to microdissect zebrafish retinas with and without retinal pigment epithelium attached, from one to three days postfertilization embryos. Zhang, L., Leung, Y. F. Microdissection of Zebrafish Embryonic Eye Tissues. J. Vis. Exp. (40), e2028, doi:10.3791/2028 (2010). Zebrafish is a popular animal model for research on eye development because of its rapid ex utero development and good fecundity. By 3 days post fertilization (dpf), the larvae will show the first visual response. Many genes have been identified to control a proper eye development, but we are far from a complete understanding of the underlying genetic architecture. Whole genome gene expression profiling is a useful tool to elucidate genetic regulatory network for eye development. However, the small size of the embryonic eye in zebrafish makes it challenging to obtain intact and pure eye tissues for expression analysis. For example, the anterior-posterior length of the eye between day 2 and 3 is only approximately 200-300 μm, while the diameter of the lens is less 100 μm. Also, the retinal pigment epithelium (RPE) underlying the retina is just a single-layer epithelium. While gene expression profiles can be obtained from the whole embryo, they do not accurately represent the expression of these tissues. Therefore pure tissue must be obtained for a successful gene expression profiling of eye development. To address this issue, we have developed an approach to microdissect intact retina and retina with RPE attached from 1-3 dpf, which cover major stages of eye morphogenesis. All procedures can be done with fine forceps and general laboratory supplies under standard stereomicroscopes. For retinal dissection, the single-layer RPE is removed and peeled off by brushing action and the preferential adherence of the RPE remnants to the surface of the culture plate for dissection. For RPE-attached retinal dissection, the adherence of RPE to the dissection plate is removed before the dissection so that the RPE can be completely preserved with the retina. A careful lifting action of this tissue can efficiently separate the presumptive choroid and sclera. The lens can be removed in both cases by a chemically etched tungsten needle. In short, our approach can obtain intact eye tissues and has been successfully utilized to study tissue-specific expression profiles of zebrafish retina1, 2 and retinal pigment epithelium3. E3 medium4 (5 mM NaCl, 0.17 mM KCl, 0.33 mM CaCl2 and 0.33 mM MgSO4). Ringer's solution1, 5 (116 mM NaCl, 2.9 mM KCl, 1.8 mM CaCl2, 5 mM HEPES, pH7.2), filter sterilized. Secure a small beaker containing 5N NaOH on a Petri dish by clay. Attach a paper clip on the side of the beaker, so that it comes in contact with the NaOH solution. Connect the negative electrode from a DC power supply to the paper clip and the positive electrode to one end of a short piece (~2cm) of tungsten wire. Wrap the other end of tungsten wire with a small clay ball and dip this end into the NaOH solution. Increase the voltage to approximately 3V and dip the wire up and down in the NaOH solution until a good etching rate is attained. A needle in good quality can usually be etched in 10 minutes. The tungsten wire exposed to the solution will become gradually thinner. When the clay ball drops off, the other side of the wire that is still attached to the positive electrode will have a sharp needle shape. Rinse the sharp needle with Ringer's solution or E3 to remove salt deposits. Attach the needle to a wooden applicator by tape or a needle holder for easy handling. The Falcon 60 x 15 mm polystyrene culture plates are ready to use for retinal microdissection. For dissecting RPE-attached retina, crush two embryos completely in a culture plate containing Ringer's solution to get rid of the adhesiveness of the surface 30 minutes before dissection. Shortly before dissection, wash the plate extensively with fresh Ringer's solution. Adult zebrafish are maintained as described4, 5. Separate the parent fish in static breeding tanks pairwise by a divider the night before breeding. Remove the divider after the room light is turned on in the next morning. Allow the parents to cross at 10-minute intervals every half an hour. Separate the fish after each crossing. Maintain the embryos collected from each crossing in E3 medium separately at 28°C. Stage embryos at 10 to 12 hours post fertilization (hpf) and restage immediately before dissection at the specific time points, according to established criteria1, 6. The procedures described in this section are common for dissecting retina (Part 3A) and RPE-attached retina (Part 3B). All fine dissections are done by a tip of the Dumont forceps and assisted by another pair of Dumont forceps for positioning the tissue. A chemically-etched tungsten needle can be used for finer manipulations if necessary. All fine dissections are performed at ~ 5-8x magnification under an Olympus SZX16 microscope equipped with an 1X objective or equivalent. Maintain the embryos in E3 medium in a bench top incubator at 28°C next to the microscope for easy embryo access during dissection. The microscope stage is warmed to 28°C by a thermo plate to minimize the influence of temperature fluctuation on gene expression. Transfer an embryo at a specific developmental stage to Ringer's solution in a Falcon 60 X 15 mm culture plate prepared as described in Part 1#3. Cut off the head with part of the anterior trunk quickly from the body. Pin the posterior end of this tissue on culture plate with the assisting forceps. Open the head on the dorsal side starting from the anterior forehead. Remove the brain so that the medial side of the eyes is exposed and is facing upward for further manipulations. Prepare the embryo as described in Part 2. Carefully brush the exposed RPE on the medial side of the eye ball that is facing upward by the tip of the forceps until a small opening to the retina is seen. Continue the brushing and peeling action until the medial side of the retina is almost all exposed. Avoid scratching and punching the exposed retina. To remove the lateral RPE on the retina which is now facing downward, approach that and brush at an angle of approximately 45° from the culture plate surface. Remove the RPE that is attached relatively firmly to the ora serrata by pinning the detached portion of the RPE to the culture plate for dissection, and then lift the retina gently. Roll the retina on the bottom of the culture dish to clean up the residual RPE. We have noticed that this particular Falcon polystyrene culture plate has a preferential adherence of RPE for approximately 20 minutes once an embryo is crushed. This property is utilized for the removal of RPE remnants. However, the retinal cells do stick to the surface to a lesser extent, which can be inspected closely under high magnification. One has to strike a balance between the completeness of RPE removal and retinal integrity. The lens often adheres to the culture plate and detaches from the retina during the rolling process. Occasionally, it is necessary to detach the lens by an etched tungsten needle with a swirling action on the lens surface. These procedures can successfully remove RPE from the retina without compromising the integrity of the tissue. This is indicated by a good overall morphology (Figure 1B and B') and histology (Figure 1B"). In particular, the preservation of the extracellular matrix in between the photoreceptor layer and the RPE is exceptionally good (Figure 1B", arrow; compare with the histology from the whole embryo (Figure 1A")). Pin the head to the culture plate by the assistant forceps. Lift the eye gently from the posterior lateral side and roll to the anterior side. The presumptive choroid and scleral tissue on the outside of the RPE layer are attached relatively tightly to the skin and can be mostly peeled off by rolling the eye carefully to the anterior side. Remove the lens with a tungsten needle after the lateral side of the eye is exposed and when the eye is still attached to the skin. These procedures can successfully preserve the whole RPE layer with the retina. Presumptive choroids and scleral tissue can be largely removed (Figure 1C, C' and C"). The dissected samples can be collected in TRIzol in an RNase-free microfuge tube for downstream RNA characterization as described before1. Figure 1. (A) Lateral and (A') dorsal view of a zebrafish larval head at 52 hpf before dissection. (A") The corresponding histological section of the larval head in (A) & (A'). (B) Lateral and (B') dorsal view of a dissected retina at 54 hpf. The surface of retina was intact from both lateral and dorsal views. (B") The corresponding histological section of the dissected retina in (B) & (B'). The structure of the retina and retinal lamination was intact. In particular, the extracellular matrix between the photoreceptor layer and RPE (A", arrows) was well preserved in the dissected retina (B", arrows). (C) Lateral and (C') medial view of a dissected RPE-attached retina at 52 hpf. RPE layer was intact and continuous, which was also indicated by the histological section of the dissected tissue (C"). The white area in C' is the optic nerve (arrow). For histology, tissue samples were collected and fixed in 4% paraformaldehyde. Plastic embedding and sectioning of these samples were performed as described3. Scale bar = 50 μm. Microdissection of zebrafish eye tissues can effectively obtain intact retinas and RPE-attached retinas. This substantially assists expression studies pertaining to a specific eye tissue (i.e. retina or RPE). In fact, we have successfully utilized these procedures to obtain RNA expression profiles of the whole retina1 and RPE3. The utility of these profiles is strongly supported by our recent identification of pathways and gene families that are perturbed in a retinal differentiation mutant2. The most critical steps in the retinal dissection procedures are the brushing action by the tip of the forceps and tissue rolling for RPE remnants removal. We find putting the elbows on adjustable arm rests in a chair during dissection can substantially stabilize the unwanted hand movements. Also, some RPE remnants may remain in the ora serrata. This is because this region can not come in contact with the adhering surface of the culture plate for dissection. Nonetheless, most RPE cells are disrupted during the brushing and peeling action and these RPE remnants are unlikely to be intact. Also, a balance should be struck between retinal integrity and the completeness of RPE removal. For dissecting RPE-attached retinas, most of the presumptive choroid and scleral tissues which look like a thin transparent membrane, can be peeled off together with the skin. It is also possible to remove these remnants by brushing the surface of the tissue, however a balance should also be struck between the RPE integrity and the completeness of contaminating tissue removal. We have successfully performed dissection from 1-3 dpf (24-72 hpf), which cover the critical stages of zebrafish eye morphogenesis7. In average it will take approximately 10 to 20 minutes from the head severing to the collection of the dissected tissues. With practice, a student can perform a good and consistent dissection within one month. Experiments on animals were performed in accordance with the guidelines and regulations set forth by Purdue Animal Care and Use Committee. This work is supported by a startup fund from the Department of Biological Sciences at Purdue University. DC power supply Lascar PSU130 Any DC supply would work. The specific voltage of a different machine will need further optimization. Disposable pestle & microtube, 1.5 mL (DNase, RNase and pyrogen-free) VWR international 47747-366 These are used for tissue collection in TRIzol for expression analysis. Dumont #5 forceps, Tips: 0.05 x 0.01mm, Inox World Precision Instruments, Inc. 500341 Fine tip dimension is desirable but is not inflexible, as one may need to sharpen the tip from time to time. Dumont #5SF forceps, Tips: 0.025 x 0.005mm, Inox Fine Science Tools 11252-00 Fine tip dimension is desirable but is not inflexible, as one may need to sharpen the tip from time to time. Falcon polystyrene culture plates, 60 X 15 mm BD Biosciences 351007 These plates are used as dissection plates. Olympus SZX16 Stereomicroscope Olympus Corporation SZX16 Any stereomicroscope would work. We used Leica stereomicroscope in previous studies1-3 without any issues. We also use the 1X objective exclusively for the dissection even though we have a 2X objective installed. Thermo plate Tokai Hit MATS-U55SZX2B This is used to maintain the temperature of the tissue throughout dissection and minimize the influence of temperature fluctuation on gene expression. We also put the whole microscope in an environmentally controlled room at 28°C during dissection in previous studies1-3 with good success. Wooden Applicator Puritan 807 This is used for holding the chemically-etched tungsten needle. 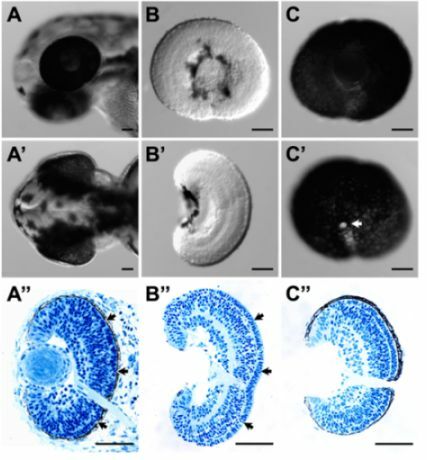 Leung, Y. F., Dowling, J. E. Gene expression profiling of zebrafish embryonic retina. Zebrafish. 2, 269-283 (2005). Leung, Y. F., Ma, P., Link, B. A., Dowling, J. E. Factorial microarray analysis of zebrafish retinal development. Proc Natl Acad Sci U S A. 105, 12909-12914 (2008). Leung, Y. F., Ma, P., Dowling, J. E. Gene expression profiling of zebrafish embryonic retinal pigment epithelium in vivo. Invest Ophthalmol Vis Sci. 48, 881-890 (2007). Nusslein-Volhard, C., Dahm, R. Zebrafish : a practical approach. 1st ed, Oxford University Press. Oxford ; New York. (2002). Westerfield, M. The zebrafish book : a guide for the laboratory use of zebrafish (Danio rerio). 4th ed, University of Oregon Press. Eugene, OR. (2000). Kimmel, C. B., Ballard, W. W., Kimmel, S. R., Ullmann, B., Schilling, T. F. Stages of embryonic development of the zebrafish. Dev Dyn. 203, 253-310 (1995). Fadool, J. M., Dowling, J. E. Zebrafish: a model system for the study of eye genetics. Prog Retin Eye Res. 27, 89-110 (2008).